The value of all cars depreciates – that’s a fact of life. Luckily, there are things you can do to keep the value of your car from plummeting. How to increase your car’s resale value? If you let your kids throw crumbs around the backseat with reckless abandon or make a habit of driving your car while sweaty after a workout, it will make your car’s interior unattractive to potential buyers. Nobody wants to buy a smelly car. Each vehicle has a suggested maintenance schedule that should be followed for best results. Following the schedule ensures your warranty is still valid and your car runs smoothly. If you sell your vehicle to another buyer (rather than to a dealership) your ability to show a clean maintenance schedule might yield a higher selling price because the buyer can be more confident the car was treated well. Even just a few dents or scratches on the exterior of your car can make it look older and more used than it is. Remember, people who purchase a vehicle want it to feel as “new” as possible, even if it’s not. Experts from Car Talk suggest you repair small dents and dings before you sell. That’s particularly important when you sell to an individual as opposed to trading the car in. The average person drives 12,000 to 15,000 miles per year, the Federal Highway Administration says. While it’s not always possible to keep mileage low, it’s a good idea to rent a car when you take long car trips and avoid unnecessary trips in your car. Adding after-market accessories to increase your car’s value may actually have the opposite effect. Buyers often don’t trust after-market accessories or consider them unnecessary personalization by the previous owner. In general, you won’t make your money back when you “invest” in after-market accessories. J.D. 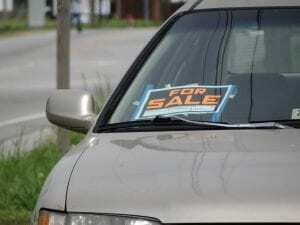 Power says selling your vehicle to a private buyer will typically yield more money than if you trade it into a dealership unless your car is in sad shape.